2013 Conference: 11 Workshops Available! • Thursday, August 29, 4:00 - 6:00 PM: Workshop with Gabriel S — "Bioenergy Workout" ($35 early, $40 regular) Gabe has been a researcher for over a decade and has given lectures and workshops worldwide for years on topics related to consciousness studies, human potential, psychic development, subtle energy, out-of-body experiences and a scientific approach to spirituality. He is the coordinator of the International Academy of Consciousness (IAC)-New York Center. The Bioenergy Workout is a fun yet informative 2-hour practical workshop during which students perform a series of diverse bioenergetic (chi, prana, subtle energy) exercises intended to help them develop their energetic capacities. Mastering our personal energies is one of the keys to maintaining equilibrium, becoming more self-aware, identifying and overcoming emotional imbalances, maintaining psychic self-defense, increasing our self-awareness and self-knowledge, unlocking our potential, and developing our psychic ability. During the workout, Gabriel will first guide students through a series of foundational exercises, gradually layering on more complex ones as the class progresses. Students learn to exteriorize, absorb, control, donate and use energies using one's will, for unblocking and healing one's self. They will also apply techniques to develop their sensitivity and perceptions, including a clairvoyance exercise. The techniques practiced help students learn to revitalize their own energetic field, protect themselves energetically, identify external energetic influences, and increase their self-awareness about their energetic condition. Additionally the approach taken in the workshop is a scientific and clear one, devoid of unnecessary mysticism and obfuscation when approaching the topic of bioenergy and it's use in personal and spiritual development. After each series of exercises participants will have the opportunity to share feedback with the rest of the workshop participants and compare and contrast perceptions and sensations experienced as a result of the exercises. Practical examples will be given in the workshop of how they techniques can be used in commons situations we find ourselves encountering in our daily lives. This workshop brings one closer to experience the energetic and multidimensional reality reported by those who have had experienced near-death experiences and other psychic and spiritual experiences. The Bioenergy Workout is one of IAC’s most popular workshops and is regularly taught in numerous countries worldwide. Many people retake this workshop several times due to its effectiveness, practicality, and the positive cleansing and healing effects experienced in the workshop. • Thursday, August 29, 4-6 PM: Workshop with Joanne DiMaggio — "Understanding Why: How soul writing answers life’s most profound questions" ($35 early; $40 regular) When faced with life’s biggest challenges, including issues concerning the loss of a loved one, we often find ourselves wishing for a guidebook; a manual to help us navigate the waters of our endless questions. While we often look outside ourselves for answers, the truth is we already have access to all the answers we need. The process of connecting to the sacred wisdom within us—that part of us that has our answers—is always available through soul writing, which is a written form of meditation. During this experiential workshop, Joanne DiMaggio will draw upon her years of experience researching, teaching and integrating soul writing in her own life to inform and support the quest for self-discovery. With clear instructions on the soul writing process, Joanne will show how divine guidance is available to everyone, not only to process grief, but also as a means of intuitive development and spiritual empowerment. Using this process, participants will learn to access that deep knowing they hold within; to slow down, open their hearts and ask! Participants are encouraged to bring a journal and their favorite writing instrument. Joanne DiMaggio, M.A., CHt is the author of Soul Writing: Conversing With Your Higher Self. The nature of consciousness – how consciousness can arise from matter – is a mystery to materialist reductionist science. Near-death experiences (NDEs) provide key insights into how the “hard problem of consciousness” can be solved – consciousness appears to operate independent of the brain. The problem that must now be solved is: how does consciousness work with the brain? In this workshop, we will explore the 3 main theories that are currently proposed: (1) the theory of essence (Kenny Arnette), (2) the mind-entity theory (Robert and Suzanne Mays) and (3) the theory of non-local consciousness (Eben Alexander). In the workshop, there will be ample opportunity for discussion among presenters and participants, and questions and answers. More about Robert & Suzanne Mays. More about Kenneth Arnette. More about Eben Alexander. • Friday, August 30, 4-6 PM: Workshop with Carol Lynn Vengroff and Carolyn Matthews – "Navigating the Road of Loss & Grief: Using the discovery of hope as your compass" (optional) 04:00 PM - 06:00 PM (Eastern Time) ($35 early; $40 regular) Cultural influences, religious beliefs, and our very own personal stories come into play with the loss of a loved one. At a time when one is vulnerable and needs the most support, these familiar views can be both a comfort and also a period of questioning. We offer practical suggestions, proven tools and NDE inspired answers to assist in navigating these times of loss and grief. We give direction, hope, and a clear path to finding one’s way. More about Carol Lynn Vengroff. More about Carolyn Matthews . • Saturday, August 31, 4:15-7:00 PM: Workshop with Nancy Clark, Ph.D. — "How to Contact Spirits of Love Ones (using the scrying mirror)" ($50 early, $60 regular) What a huge sense of relief it would be if those left behind were given tools to help them contact those who had passed on! Perhaps the greatest advantage would be that those left behind would no longer fear their own death. Children who lost parents at an early age would know that they are still with them. People who did not get to have that final conversation would realize that they still could. Those who passed from suicide could express why it happened and that their closest loved one should not feel guilty. Beloved animals are still nearby and healthy. The technique of scrying with a mirror will be introduced that may help participants to be in contact with those on the other side. Participants will need to have a black scrying mirror with a stand, either one that they bring or they may order one for purchase from the Conference Bookstore (about $30). Please place your order when you sign up for this workshop, before August 15; a limited number of additional mirrors will be available in the Bookstore during the Conference. More about Nancy Clark. • Saturday, August 31, 4:15-6:15 PM: Workshop with Sabine van den Bulk and Yvonne Sneeden — "Grieving Heaven: Aftereffects and Spiritual Transformation ~ Fragaria Therapy and Think Heaven Now" ($35 early, $40 regular) The Aftereffects Surviving an NDE can be a traumatizing and isolating experience for some, and an exciting one for others. So where do NDE Experiencers go from there? 1. The Fragaria Therapy (Sabine van den Bulk): Sabine, physio and psychotherapist, specializes in working with NDE-experiencers and has developed a method to treat the NDE aftereffects and help NDErs to heal and re-integrate a happy life here on earth. 2. Think Heaven Now: Yvonne Sneeden, founder of ThinkHeavenNow, will share about the spiritual transforming changes resulting from an NDE and how to transform the grief and ‘Homesick’ feeling into a full and rich life now, by taking the information and lessons learned during an NDE and applying Heaven’s realities in our daily lives to change ours and others’. Sabine and Yvonne will share how to bring the spiritual and medical aftereffects into one transformative life Now. More about Sabine van den Bulk . More about Think Heaven Now. 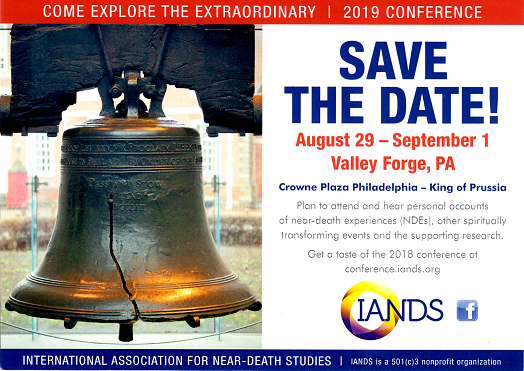 • Saturday, August 31, 4:15-6:15 PM: Workshop with Virginia Hummel — "NDEs and the Orb Phenomenon: Shifting our perception of death and healing our grief" ($35 early, $40 regular) Bring your cameras! Photographic evidence of orbs with human faces, along with an ability to appear upon request, present a strong argument that orbs can be a manifestation of our soul/consciousness energy. As the latest revelation of After Death Communication, orbs allow us to be proactive in healing our grief. A simple digital camera gives us an amazingly effective tool with which to visually communicate with loved ones and confirm their well-being as well as our own eternal natures. During this experiential workshop participants will learn a simple technique to connect with their loved ones, increase their spiritual experiences and photograph orbs. As a bereaved parent, Virginia learned that mastering this technique gives us the opportunity to reframe our grief experience and shift our perception of death. Bereaved individuals have reported that the presence of orbs brings them peace, comfort and hope during the most challenging time of their lives. Many NDEs have been reported as involving “balls of light,” either for how the near death experiencers see themselves or how they see others. We will present stories and photos from both NDErs and non-NDErs of extraordinary orb encounters with loved ones. Meet a woman whose incredible NDE with God not only gave her the ability to bring healing messages through to those in need, but the ability to communicate with orbs and see the faces inside them. We will learn tips to take beautiful orb photos and connect with our loved ones in a whole new way. More about Virginia Hummel . • Sunday, September 1, 3:30-5:30 PM: Workshop with Alan Hugenot — "Physics of the Afterlife" ($35 early, $40 regular) This workshop is on the Physics of the afterlife, as explained in Chapter 6 (Consciousness and Quantum Field Theory) of my 2012 book The Death Experience: What it is like when you die. Skeptics often use the basic concepts of Newtonian materialist science to undermine people’s belief in the afterlife. But the leading Quantum Physicists have known that the universe itself is conscious, for over 80 years now. In the last 30 years there has been much data developed which provides proof of the afterlife, yet it is not common knowledge. IANDS published Chapter 7 (The Weighing of the Heart) of Hugenot's book The Death Experience in the Winter 2012 issue of Vital Signs. More about Alan Hugenot .